WP Tips and Hacks – Page 3 – Take control of your WordPress site with simple coding hacks and video tutorial tips. So yesterday I showed you how to change the post title, as in the H1 tag of the post page, based on the category of the post. That doesn’t change the title tag, however. Users don’t see or pay attention to the title tag as much, especially with browser tabs only offering limited space for them. But search engines see these and use them in search results. The H1 title tag of your post may not be idea for SEO. A title may work better if you could append or prepend special text depending on the category. For instance, if you review bars and restaurants, you may want to prepend Bar or Restaurant to the title, which is usually just the name of the establishment. I’ve heard the term “one-page site” a lot recently, and they make sense for a lot of purposes. But using WordPress for one-page sites seems a little odd. After all, WordPress’ strength is as a content management system. All sites should have a simple Favicon image that browsers use in various places. WordPress makes this easy by allowing you to upload a square site image that will be used as your Favicon as well as in other places like as a Homepage bookmark icon on mobile. Wouldn’t it be nice if you were talking about a page at a website and you could easily include a screenshot of that page? It is actually very easy to do this once you add a shortcode to your functions.php or custom plugin. And the code is very short too. Having that admin bar at the top of your WordPress site can be a nice way to jump from viewing your site into editing the post you are viewing or some other setting. But sometimes you’d rather have the site look to you like it does to others. Suppose you want to publish a post in the near future, but allow people to view it now. Why would you want to do that? Well, suppose you have a regular publishing schedule like I do. But then someone asks a question and you create a post that answers that question. You already have the next few days’ worth of posts scheduled, so this new one is set for next week. But you want to be able to let that person see the post now. So you want the post to appear on your front page, feeds, and category lists as scheduled. But if someone knows the URL, then they can view the post instead of seeing a Not Found error. You don’t always have to use text or video for your posts. You can use just some audio when it is appropriate. For music creators, it can be ideal. But even for wordsmiths, it can sometimes be useful to turn a voice recording into a post. 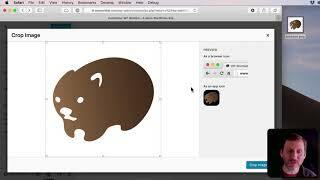 It can help you get complex ideas on to your site quicker, and provide a nice personal touch. 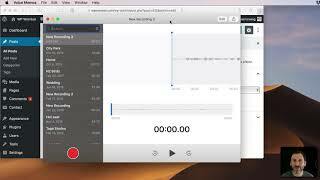 If you are a Mac user, you can use the Voice Memos app to record and drag directly into WordPress. If you experience the “security reasons” bug when trying to upload your audio, see https://wptipsandhacks.com/hacks/fixing-the-security-reasons-media-upload-bug.html for a solution. There are lots of people complaining about trying to upload media to WordPress and getting a “Not Permitted For Security Reasons” error message. Sounds pretty serious, but what it actually means is that the file type is not on a list of allowed file types for upload. So if you are trying to upload an audio .m4a file, like I was this week, it doesn’t mean m4a files are security risks, just that the file type isn’t on the list of allowed types.